May we wish everyone a Happy Christmas and pleasant New Year. This month we bring you news of our new 1:19 scale locomotive, Dolgoch, for 2019, the arrival of Mona, our contribution to the War Office Locomotive Trust and raising funds for Peter at Amberley. We are also listing some end of season bargains to be had, just before Christmas! Dolgoch was built by Fletcher, Jennings & Co. in 1866 and is one of the oldest locomotives still in active service. The locomotive was renamed Pretoria between about 1900 and 1914 in celebration of the relief of that township in South Africa by Lord Roberts during the Boer War. In early 1945, Dolgoch was sent to the Atlas Foundry in Shrewsbury to be overhauled. At this time, the railway’s only other locomotive Talyllyn was so worn out it could not be safely operated and services on the railway were suspended. Dolgoch returned to service in September 1945. Dolgoch was the only operable locomotive from 1945 until 1952, when Edward Thomas was restored for use. Between 1954 and 1963, the locomotive underwent a major overhaul. Dolgoch returned to service in late 1999 after a further overhaul involving firebox repairs and an extensive mechanical overhaul, including the fitting of air braking equipment, the last Talyllyn steam loco to be so equipped. After receiving a new boiler in 2011, it ran in Crimson Lake livery until 2015 when along with its sister locomotive Talyllyn it was repainted in ‘Indian Red’ livery. A percentage of the retail profit from each sale will be donated to the Talyllyn Railway for the future overhaul of Dolgoch, a higher percentage if the model is bought direct from Accucraft UK Ltd. We would like to acknowledge the help we have received from Talyllyn Railway members in preparing the drawings for this model. Photo courtesy of Geoff Loynes. You can find full details of the model here. Last call for the Isle of Man! Mona is due for delivery shortly. 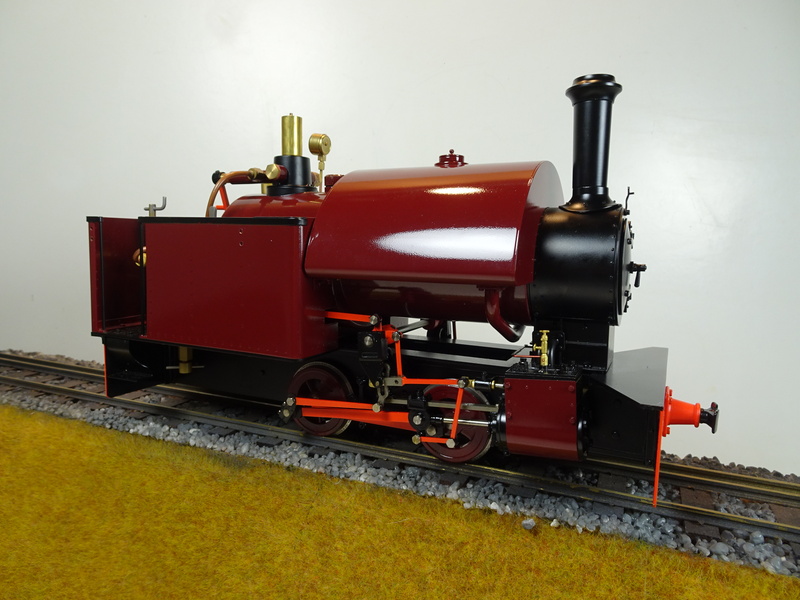 We have now produced a fair cross-section of Isle of Man 2-4-0Ts and Mona is likely to be the last one we make. All the Indian Red ones are pre-sold (both live steam and electric) and there aren’t many Ailsa Green ones unspoken for so don’t miss out! This really is the last call for the Isle of Man 2-4-0T! 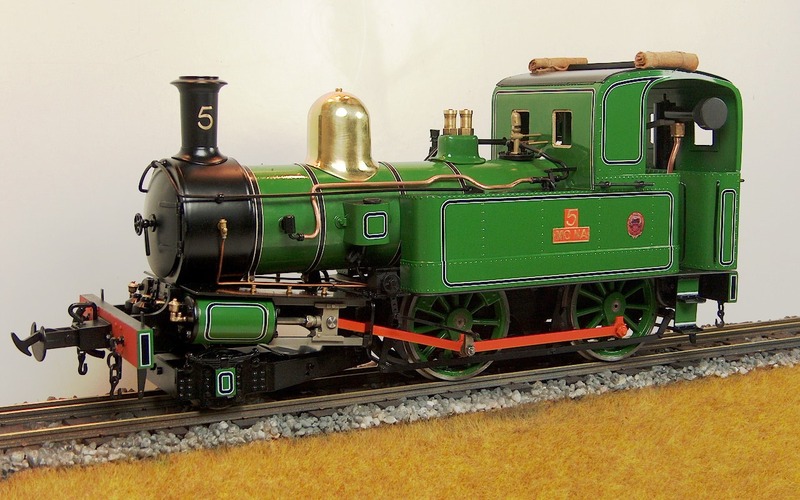 Our ‘museum quality’ 1:19 scale locomotive for 2018 was the WD Hunslet 4-6-0T and we are pleased to say the model proved enormously popular. Having worked with the Trust to produce such an accurate model it was only appropriate that we gave a little something back and at the Warley exhibition in November (where No. 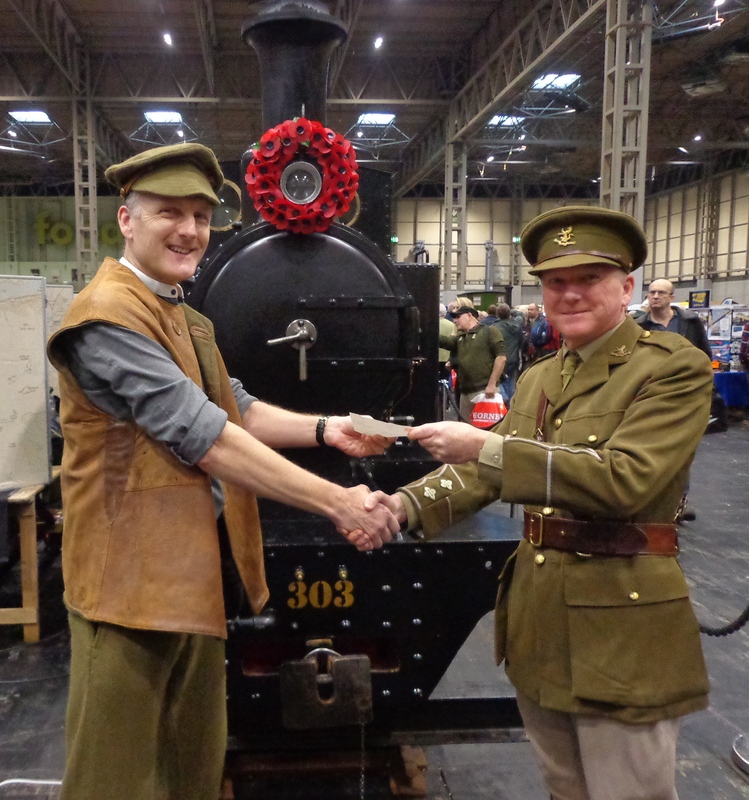 1215/303 was on show), Graham Langer, Managing Director of Accucraft UK Ltd., was delighted to hand over a cheque for £3000 to Ian Hughes, the prime mover behind the locomotive’s repatriation from Australia. “A Bagnall for a Bagnall” – We have donated a rather unique variant of our 7/8ths” Scale Bagnall saddle tank to Amberley Museum in West Sussex. The museum is raising funds to restore Peter, a cabless version of our model so we thought we’d see what ours looked like in the same condition. 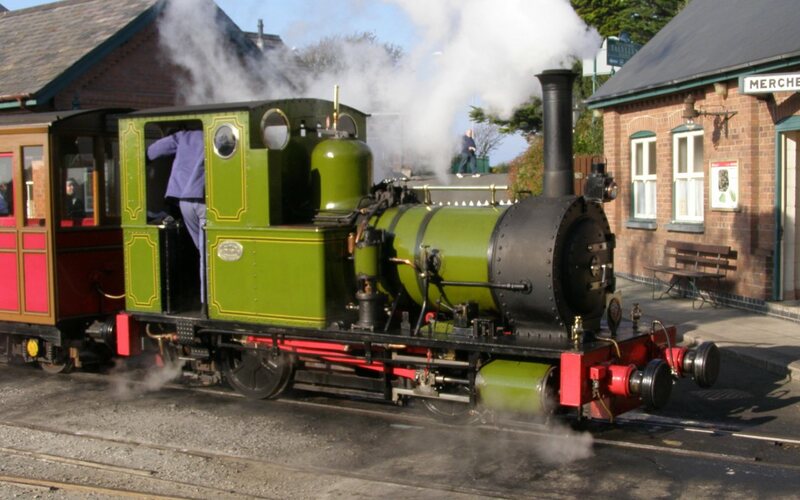 Peter was originally commissioned by the war office for forestry operations in Cumbria, then after several owners was purchased by the Cliffe Hill Quarry, Leicestershire in 1922, where it is believed that Peter was named after the owner’s son. In 1954 Peter was acquired by the Narrow Gauge Railway Society and eventually joined the Brockham collection in 1965. Peter was moved to Amberley in 1982 and after a lengthy restoration project led by Doug Bentley and members of the Amberley rail group, Peter became operational at the museum in 1994. To this day Peter has been a hugely popular attraction for young and old alike, pulling the Santa Express at Christmas, giving mums and dads a once in a lifetime opportunity to drive a steam engine on Mothering Sunday and Father’s Day; as well as running at many of our major events. The time has now come when Peter is in need of boiler repairs and a full service, with costs expected to reach up to £40,000. The museum has started a Peter restoration fundraising campaign, and has already received donations from Cliffe Hill Quarry and the Narrow Gauge Society. If you’d like to bid for this unique Accucraft locomotive (which will be supplied with the original cab and chimney should the new owner wish to re-fit them), just download the sealed bid auction form here and return it to Amberley Museum. We also have a number of repaired Mk1 coaches (they had loose interiors) available for £225.00, mainly SOs and FKs – please enquire about availability. * The four RCH wagons will be your choice of four different types of ‘Big Four’ or BR liveries – £300.00 worth of wagons free if you buy a ‘Victory’!